Manchester City are continuing to monitor a player long linked with a move to the Etihad, Julian Weigl of Borussia Dortmund, according to today’s Sunday People. 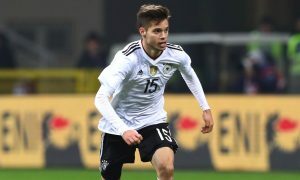 Weigl has been linked time and time again, even in the days leading up to Pep Guardiola’s appointment as manager, with many feeling that the 22-year-old has the perfect profile for a Guardiola midfield. The Catalan coach does plan to add a holding midfielder in the summer, but most signs point to it being Fred of Shakhtar Donetsk, with a deal reportedly close to being done. But Neil Moxley of the Sunday People claims that City have dispatched scouts to Borussia Dortmund’s last few games to watch the talented Germany international, with the signs being that he is on Guardiola’s midfield shortlist. Were BVB to sell Dortmund, the buying club would be looking to pay at least £40million to sign him up. In the long-term, City will need replacements for both Yaya Touré, 34, and Fernandinho, 32, but the Brazilian remains a key component of Guardiola’s squad and recently signed a new deal, meaning only one new player for the ‘No 6’ role is likely to arrive in the next transfer window.